Dynamic Perception sent me an NMX Digital Motion Controller so that I can integrate it into qDslrDashboard. I would like to thank them here again for sending me it and for making such a great product. The NMX Controller allows controlling over the USB serial or Bluetooth Low Energy ports using the MoCoBus protocol. In qDslrDashboard the MoCoBus manager will be used to detect and connect to devices that support the MoCoBus protocol. Here is a screenshot of the manager dialog. In my case the NMX Controller is on COM26 on my Windows machine. With the device address the user can select the MoCo device address for connection, by default the NMX Controller address is 3. The connection with the device is established by clicking on the item. 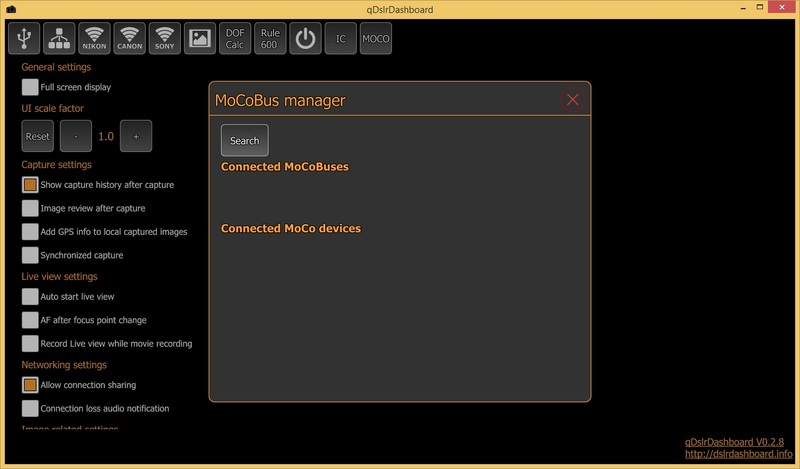 Under the ‘Connected MoCoBuses’ are listed the currently connected ports and by clicking on the item the manager will show the MoCo devices that are connected to this bus. 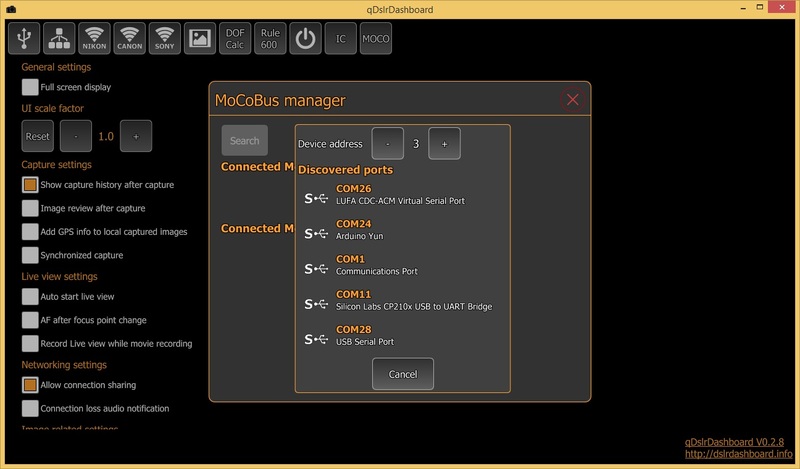 Under the ‘Connected MoCo devices’ are listed the MoCo devices that are connected to the selected MoCoBus port, in my case the Dynamic Perception NMX Controller. 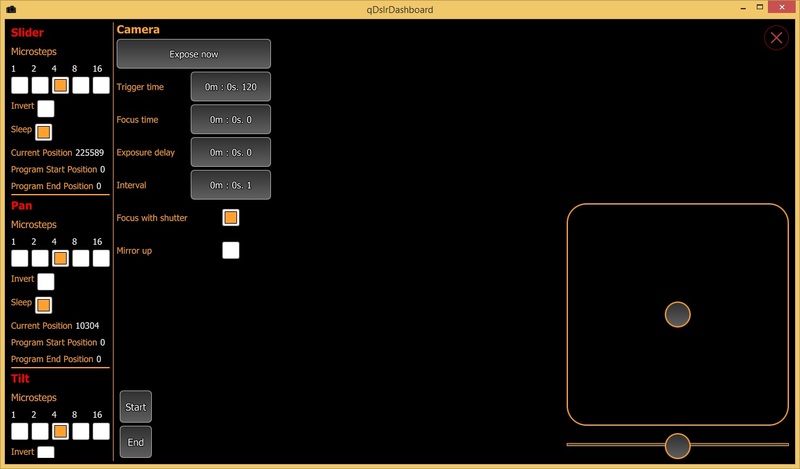 The NMX Controller screen is still under development. Till now I implemented the joystick mode where the motors connected to NMX Controller can be moved with the controls on the right side of the screen, the motor parameters can be changed and the camera parameters. Still need to implement the programming part. Still lot of work ahead but I’m very happy with the progress I made till now. I´m using the NMX myself and love it, can´t wait to see more of your integration and test it out. Super exciting, 100 times thumbs up!!! Looks very very very good!! When can we expect to get this Version (0.2.8) ? It will be probably in V0.2.9. In the current Qt version (5.4) the Bluetooth Low Energy (BLE) is only available for Linux in a preview version. The upcoming Qt 5.5 version should bring BLE also for Android and iOS devices. Maybe I release a desktop test version (Linux, OSX, Windows where the serial connection is working), but there is still lot of work. Would be good for android to be able to use any BT and select it and pair so I may use our skywatchers merlin mount to do panning time lapses . Yes it is standard BT on android there are apps like Virtuoso ,PanoramApp, and PandroidWiz I am sure if you contact the and ask them about the code they could help within the apps you can turn the Skywatcher mount ! Also on PC and Linux is Papywizard I have it running on a Nokia 810 tablet and PC. Will check out, hope I will be able to get such a unit, without it is hard to code and test. will this be able to be used in conjunction with the the LRTimelapse feature? Nice to see you adding new things, good to see progress. My biggest concern is when will you work on making the application more stable? It crashes very often and makes it unusable. Sent you some messages but no response. It crashes on android whenever it wants, iPhone, android tablet, iPad air, it’s not stable. Wouldn’t it be better to focus on making it as stable as possible before adding more feature that will add more weight and more potential instability problems? Actually this is a separate branch. The main branch is used for fixes. As you can see http://dslrdashboard.info/phpBB3/viewtopic.php?f=3&t=238 I’m working on fixes/stability. When will 0.2.8. be available for Android?